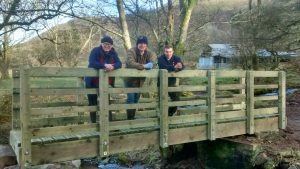 Brecon Beacons National Park Authority have replaced a key bridge linking a public footpath to the Brecon Beacons mountain range. The project is part of the Rights of Way Improvement Plan Funding Programme for the National Park and is one of eight schemes funded through the Welsh Government. 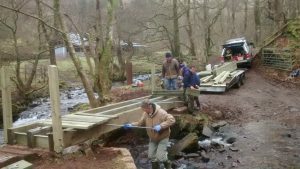 The National Park Wardens worked alongside volunteers to replace the footbridge on the northern edge of the Beacons at Login, not far from Libanus. The route is popular amongst walkers and with the spring season approaching, it will be well used over the coming months. Over five million people visit the National Park every year and walking is one of the most popular activities. The Rights of Way Improvement Plan focuses on maintaining and improving the network of walking routes that can be enjoyed by visitors and locals alike.